Model-Driven Software Engineering in Practice. The MDSE book. Morgan & Claypool, USA, 2012. Synthesis Lectures on Software Engineering #1. 182 pages, paperback and e-book. This book is an agile and flexible tool that introduces you to the Model-driven Engineering world. It presents its basic principles and techniques, and puts them at work on freely available Eclipse-based tools. This lets you choose the ideal set of MDE instruments so to get benefit from MDE right away. If you have any feedback about the book, please send us an email: info@mdse-book.com. Model-driven Software Engineering (MDSE) in Practice. 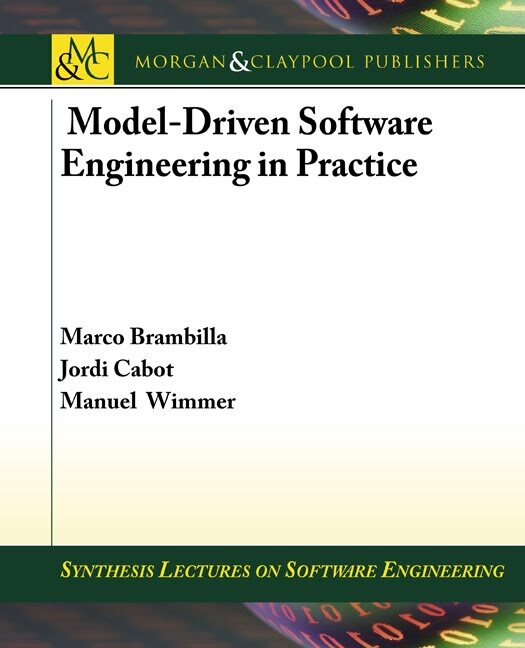 The book on MDD, MDE, MDA, MD* by Marco Brambilla, Jordi Cabot, and Manuel Wimmer.